10:30 a.m. - Breakfast at Katz-N Jammers in Lancaster. A guy parked out front has a comically oversized ball hitch mount on his rear bumper. He tells us it's for towing the Space Shuttle. Desert humor. 11:30 a.m. - Apparently there are go-kart races going on, but it's so damn hot that we retreat to the air conditioned car. 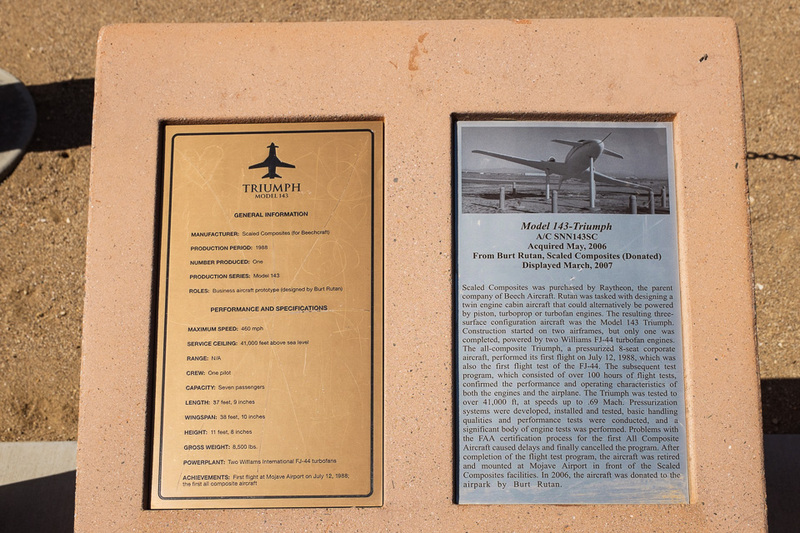 We visit Blackbird Airpark and Joe Davies Heritage Airpark. These adjacent parks are worth a look if you're in the area. 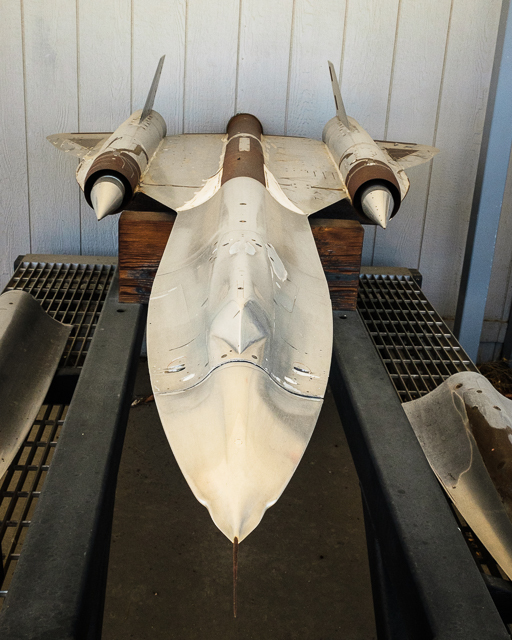 They have an SR-71A and an A-12 on display. 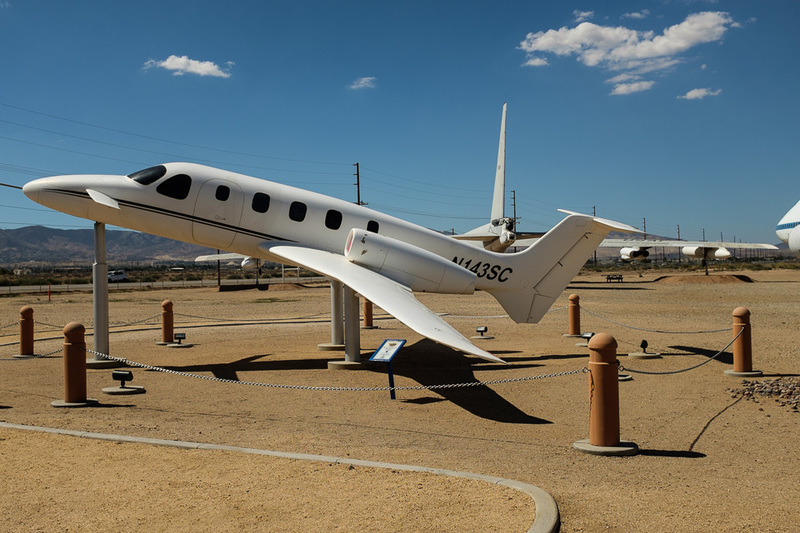 There's also a one-of-a-kind business jet prototype built by Burt Rutan. 12:30 p.m. - We drive across the desert to Victorville. In Apple Valley, we encounter a car with MOAR downforce than mine. 4:00 p.m. - We arrive at our rental in Yucca Valley, and immediately learn how to operate the evaporative coolers. They work reasonably well. 5:30 p.m. - Dinner at Royal Siam in Joshua Tree. We sit at the same table as last time. I order the same thing. It's good. 7:00 p.m. - We drive out to Wonder Valley, the land of abandoned homesteads. Yeah, if you love forlorn, abandoned shacks, this is the place. Our friend and Joshua Tree resident David Dasinger shows us some good ones. I started off with this photo of this abandoned camper, furniture, and detritus. This shot is 9 minutes at f/11, ISO 200 with long exposure noise reduction turned on due to the hot weather. I turned around and walked about 10 feet before I set up this next shot. Two eight minute exposures were combined for 16 minute star trails -- both with noise reduction turned on. The EOS 6D allows you to buffer noise reduction until after your shots are over. The exposures run back-to-back so there's no gaps in the star trails, and then the camera runs noise reduction on both shots. During the 16 minutes that the camera is locked up, I got a snack and setup my next shot. The fence posts around this abandoned house looked great from a lot of angles. The first shot is a 10 minute exposure, and the second shot is two 10 minute exposures, again with noise reduction on to combat the heat. We scouted a few more abandoned homesteads, and made a few more photos before driving back to town. The next day we remained indoors to stay cool because it was over 100º outside. In the evening we stocked up on sandwiches and drinks, and checked out the sunset at Amboy Crater. We spent a few hours shooting the abandoned Roadrunner's Retreat on Route 66 in Chambless. I shot sixteen 360 night panoramas. As the weather was still almost 90º, I continued to use noise reduction. Each panorama requires 4 shots around, which would fill up the 6D's buffer. After waiting a minute or so, I could take an optional nadir shot. By the time I had my next shot set up, the noise reduction was usually done. This technique uses more battery life, but really helps keep the long exposure noise down. Shooting in a t-shirt and shorts is nice, but cooler weather sure is easier. The initial panoramic stitching is done, but I still have many hours of post-processing before the ground is patched and tripod shadows removed. We also spent a little bit of time shooting at Roy's in Amboy, and then drove back to Joshua Tree for some sleep. The next day we made the 8 hour drive back to the Bay Area. Interstate 5 on the way home is always my least favorite part of the trip. I suppose we have to suffer for our art. I'm sure that hours of fixing the ground on these photos in Photoshop will confirm that theory once again. For now, here's a 360 panorama with light painting from Roadrunner's Retreat. Click on the image for a larger view and enjoy! During the April full moon, I went on a night photography trip to the Mojave and Joshua Tree (Part I, II, and III). Last month, I went back. The weather was unseasonably hot for late September -- around 100º in the daytime, and often still over 80º at midnight. Here's what happened. 1:00 p.m. - we eat sandwiches by the side of the road, and then take a detour off Interstate 5 to drive 33 through Coalinga. I miss the turn to continue on 33 South, and we drive by the impressive Pleasant Valley State Prison and Coalinga State Hospital facilities. 3:30 p.m. - We continue south on I-5 and exit at Lebec to have a look at Fort Tejon State Historic Park. 4:00 p.m. - We take the twisty side road through Gorman over to Route 138, the Pearblossom Highway. Onwards into the desert. 4:30 p.m. - We scout a nice looking location along the way, but it looks like someone is living in a trailer on-site. 5:30 p.m. - We check in to the Oxford Inn and Suites in Lancaster. The Oktoberfest special includes dinner, 2 free drinks, and breakfast the next morning. It's hot out, so we take them up on the drink offer. We skip the Chicken Florentine at the hotel, and opt to eat at Taqueria Pepe del Toro instead. 8:00 p.m. - We take a look at a short dirt road down to a plane, and decide the sandy road requires 4wd. It's still over 90º, so we decide not to hike it. Leaving the car in this area would also not be smart. 8:30 p.m. - We stop to shoot an abandoned gas station. Above is how how it looked back in 2008 on Street View. Some further research shows that the gas station was operating as a marijuana dispensary in 2014. The sodium vapor lights seem strong near the street, but after some test shots we decide to shoot anyways. I find an angle that I like, and set up a shot. I stopped down to f/11 to get the nice pointed stars on the two light sources. I also spent some time adjusting the foreground/background tonalities using luminosity masks in Photoshop. Above you can see how my second setup looked straight out of the camera. I knew that the perspective would need to be corrected in post processing so I shot slightly wide. I was able to correct the distortion during the RAW conversion in Lightroom. Then I brought the image into Photoshop to work on the tone and local contrast, again using luminosity masks. I'm happy with the composition, but a 10-minute exposure doesn't fill the sky with enough star trails. This shot really needs more like 30 minutes for the trails to circle around Polaris. I do like the the complementary colors, and have created a look that is close to how slide film would have rendered the scene. While taking the photo, the couple that live in the trailer on the other side of the fence argue loudly about who has to do the dishes. We decide to move on to the next location. 10:30 p.m. - I hadn't visited the old Alta Vista neighorhood signs since 2007, so we headed that way for a couple of shots. Midnight - We rolled past the movie set and Kill Bull church in Hi Vista. The church has a strong light on it, and I've shot the movie set under better conditions, so we moved on. 12:30 a.m. - The next location was an old stone church with a nice view of Antelope Valley. My car was parked just down the road where you see the light streaks on the left. We saw a police car pull up and two officers got out to inspect my car with a flashlight, but they left after a quick look. We finished our shots, and then drove back to the hotel to get some sleep. Amboy Crater National Natural Landmark is out on Route 66 in the Mojave Desert, just up the road from the famous Roy's sign. You can hike to the top of the 250' cinder cone, but we just ate sandwiches in the parking lot instead because it was 93º outside. Take a look around from the vista point in the Amboy Crater 360 Sunset and Moonrise Panorama. I exited Highway 5 at Lost Hills, and got on California State Route 33 to drive through the oil fields. I got stopped for a while by road construction, and ate some pizza in the car. It was 99º outside. I tried to visit the West Kern Oil Museum, but it's not open on Wednesdays. Then I drove over 33 to Ojai. What a road! I went to the largest independently owned outdoor bookstore in the country, Bart's Books. Cool place. The next day I drove a bunch of twisty roads in Malibu. Hitting the canyons on a weekday was a lot of fun. Empty winding roads and great views. Then I cruised down Highway 1 into Los Angeles. The next day I attended a tour of Edelbrock's facility in Torrance, organized by my mechanic and all around nice guy Neal. The factory was truly impressive, with a nice mix of million dollar machinery and good old fashioned work done by hand. 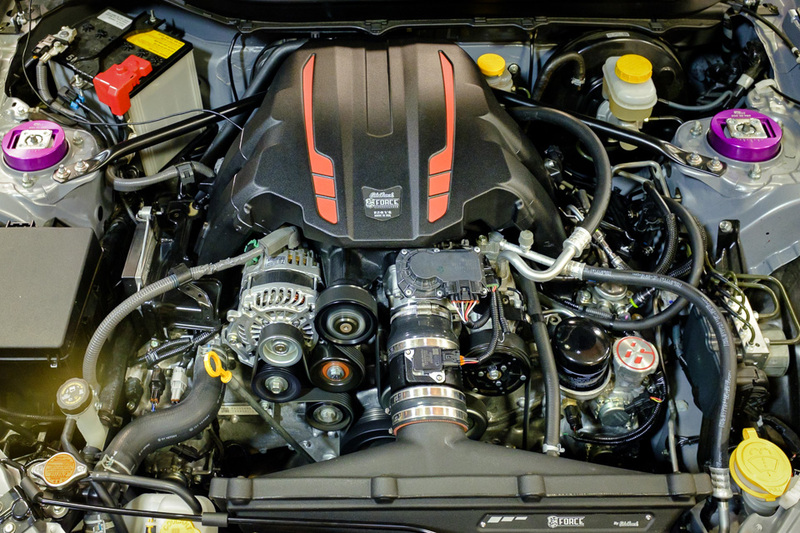 We got to see the new Edelbrock supercharger for the Scion FR-S/Subaru BRZ/Toyota GT86, and then we took over the parking lot for a photo shoot with our cars. 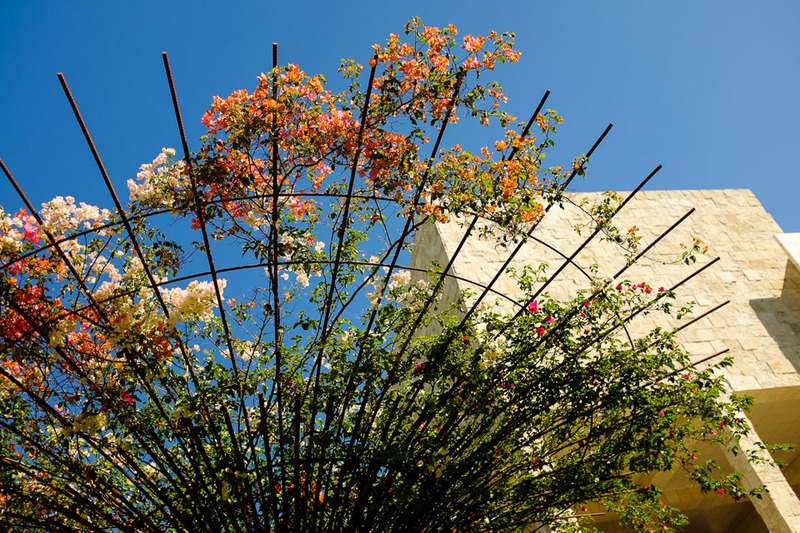 The next morning I visited the Getty Center. I arrived about 20 minutes before the museum opened, and walked through Robert Irwin's amazing garden before it got crowded. If you haven't read Seeing is Forgetting the Name of the Thing One Sees, I can't recommend it enough. It's a truly mind expanding book for any artist. was really good. No photos were allowed, but there is a book. The prints by John Chiara and Chris McCaw were particularly great. McCaw's book Sunburn is essential for anyone interested in long exposure photography. The weather and crowds started heating up, so it was time to say goodbye to L.A., and head back to the Bay Area. Technical note: All of the photos except the 360 were shot with a Fuji X100s that I recently purchased used. I'm really impressed with the design, handling, and image quality of this camera. The optical viewfinder is fantastic. Brings me back to the days when I was shooting with a Leica M6. And being able to choose Provia or Velvia profiles during RAW development in Lightroom is fantastic. So far the X100s seems like the perfect travel camera. These crumbling concrete dinosaurs were built in the early 1970's in a small Mojave Desert town. The creator originally wanted to make a miniature golf course. 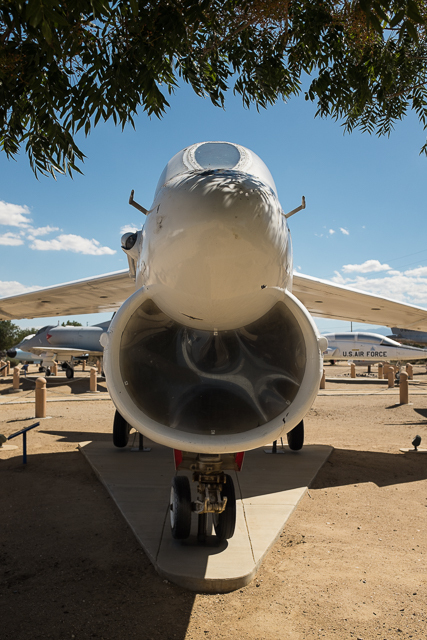 There are five panoramas in the virtual tour. These panos were shot using a Nodal Ninja R1 on a carbon fiber pole. 10:30 a.m. - The view out of my window in the morning was lovely. Depart Yucca Valley for Borrego Springs. 12:00 p.m. - We stop at the large gas station in Salton City that stocks items for the OHV crowd. 1:00 p.m. - We eat lunch at Carmelita's with my aunt and uncle, who have been living in Borrego Springs for 30 years. My uncle, a trim and witty octogenerian, eats us all under the table, polishing off a big enchilada plate and an order of banana chimichangas for dessert. After lunch, we explore some of the local landmarks including Old Borego, the abandoned gas station, and an authentic London Bus. Did I mention that the ocotillo were in bloom? If you're in the Borrego area, Ricardo Breceda's sculptures are a must see. Here I am doing some off-roading. You can take Highway 78 between Borrego and the Salton Sea, but SR22 is a prettier drive. While discussing the various groups who have an interest in this beautiful area, David quotes the dirt bikers' creed, "you can't break the desert." We tour the west side of the Salton Sea, starting in Salton City. I've been meaning to get back to the Sidewinder Snowbird Golf Course, and find it after some wandering. We drive by some of the local landmarks including Capt'n Jim's, and the former site of the Salton City Yacht Club. 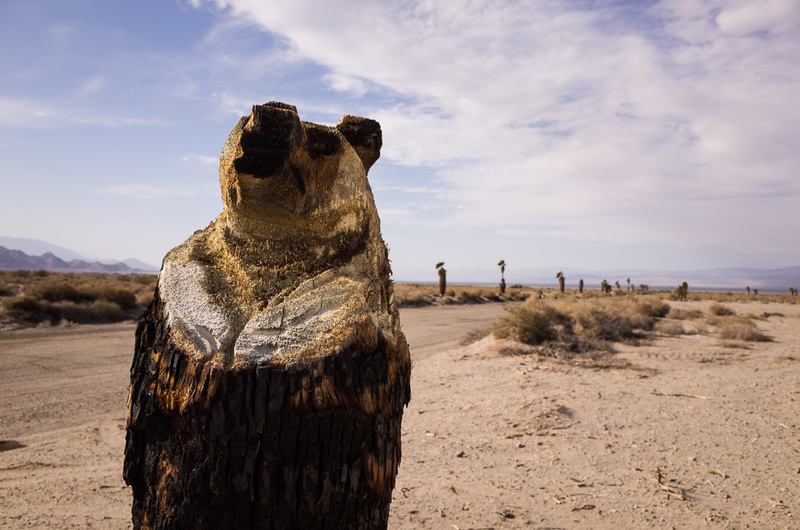 We continue up 86 S to Salton Sea Beach and Desert Shores, stumbling across some burned palm trees that have been carved into chainsaw bears. We enjoy the sights, and the late afternoon light. I convince my compadres to eat at Native Foods in Palm Springs, and then we drive back to Yucca Valley to gear up for some night shooting. Friend and Joshua Tree resident David Dasinger drives us into the park. The full moon is huge, and there's hardly anyone around. There are so many good views of the wild rocks and dense joshua trees. I set up a long shot, and lay down on a smooth rock to enjoy the view. Even though it's a full moon, the stars and planets seem more intense out here away from the light pollution. And these trees are crazy. What planet am I on again? We drive over to the Cap Rock area, and enjoy the scenery. Thanks again to David for taking us out shooting, and to Steve for being up for exploring the side roads. The trip concludes with a 500 mile drive back to Berkeley on Sunday. We eat PB&J's and do the whole haul in just over 8 hours. Wandering around the desert for a few days and nights is a lot of fun. I hope this trip diary inspires you to go on your own adventure soon! 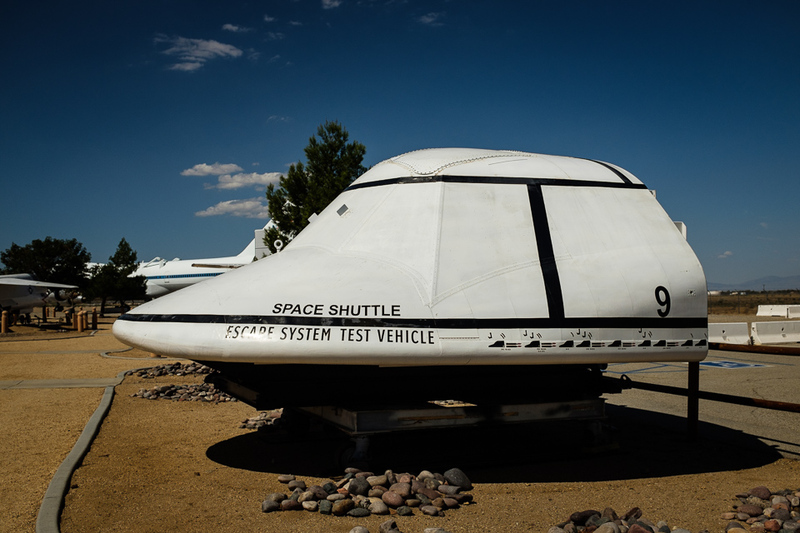 The Mojave Desert road trip continues, featuring exciting remodeling tips, a doomsday sale, dinosaurs, Thai food, and the abandoned houses of Wonder Valley. 10:00 a.m. - The bathroom door remodel at the Mojave Desert Inn was simple, but effective. 10:30 a.m. - We drove down the alleyway from the motel, and photographed the abandoned Mojave Apartments with their wonderful wooden sign. 11:00 a.m. - Breakfast at Stoken Donuts in Mojave. 11:30 a.m. - We did some shopping during the 2nd Annual Dooms Day Sale at Bob's Army Navy Store. 12:30 p.m. - The Hilltop House in Apple Valley has a fascinating history. I plan to visit this location the next time I'm in the area. 1:00 p.m. - I've always wanted to visit the concrete dinosaurs in Apple Valley. Cool spot! The neighbors didn't seem bothered with our daytime shooting, but I could see how the lights and dogs could be a problem for night photography. I also shot some 360 pole panoramas that I still need to process. 4:00 p.m. - The quiet, AirBNB spot where we stayed in Yucca Valley was wonderful. And I'm not just saying that because of the lenticular squirrel wall art. 6:00 p.m. - We met up with our friend and recent Joshua Tree transplant David Dasinger for some thai food at Royal Siam. The $12.95 dinner special is a good deal. 8:00 p.m. - Mr. Dasinger kindly took us on a tour of some abandoned houses out in Wonder Valley. David has been exploring these jackrabbit homesteads since moving to J Tree last fall. Stay tuned for part 3 of this adventure, featuring Borrego Springs, the Salton Sea, and Joshua Tree.